this item is reduced because it has a tiny part of a petal missing - not really noticeable unless you know where to look. 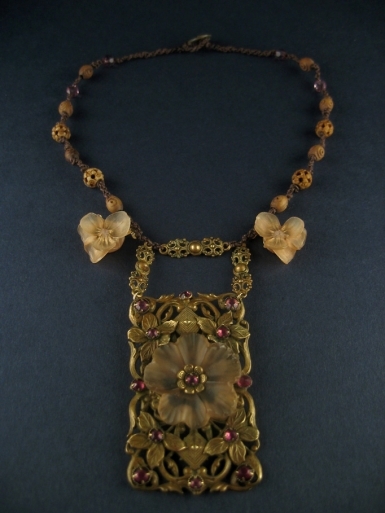 Handmade necklace comprising beautiful vintage filigree centrepiece and vintage flower trinkets and vintage carved wooden beads. Length is 41cms extending to 51cms with extra included button and loop extension (or if you require a different length you can order a specific length of extension at no extra charge)Comes in beautiful black /gold embossed faux fur-lined presentation box. POSTAGE IS FREE ON THIS ITEM !